Veterans stand to benefit from the extension of a groundbreaking program that uses artificial intelligence (AI) to better sequence the tumors of cancer patients nationwide. The U.S. Department of Veterans Affairs and IBM Watson Health announced the extension of its public-private partnership that launched two years ago as part of the National Cancer Moonshot Initiative. 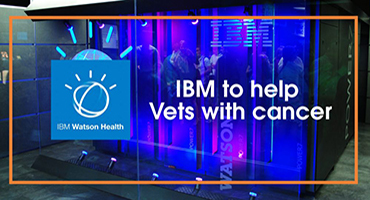 The precision oncology program—which primarily targets veterans with advanced stage cancer that is not otherwise responding to treatment—will allow VA oncologists to continue to use IBM’s leading AI technology for another 12 months. The VA created a central facility in Durham, North Carolina, staffed by a small group of oncologists and pathologists, to host the program. These scientists sequence the tumor DNA of veterans before applying IBM Watson’s machine intelligence to the data. The hope is to better understand specific genetic mutations and identify therapeutic treatments that may better target individual cancers. “VA is leading the nation to scale and spread the delivery of high quality precision oncology care, one veteran at a time,” said Dr. Kyu Rhee, chief health officer for IBM Watson Health. The focus on precision medicine has gathered momentum in recent years as advances in gene therapy hold out hope for the development of more personalized, effective treatments for difficult-to-treat conditions, including cancer. “You can match a blood transfusion to a blood type: that was an important discovery. What if matching a cancer cure to our genetic code was just as easy, just as standard?” then president Barack Obama asked in 2015 during the launch of the federal government’s Precision Medicine Initiative.